It looks like September will finish with several more dry days and so I've summed up July - September rainfall for this quite dry season of 2009. 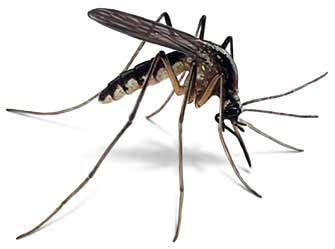 The photo above relates to a real benefit of a very dry summer here - there were almost no mosquitoes buzzing about our front porch this year; allowing us to enjoy the evenings outside without swatting. July-August-September rainfall totaled 4.17 inches for 2009. This makes this summer the third driest one of the last eleven years (I started keeping rainfall records at this location in July 1999). The two years that were even drier were 2001 at 2.64" and 2000 at 3.91". However, 2000 was an unusual year with rainfall of 3.19" during June (the only June here at house with more than half an inch). For contrast, JAS wet years were 2008 with 10.99" and 1999 with 10.61". So that ends the frustrating summer "monsoon" season of 2009. It will be interesting to see what October brings - October here is usually very bi-modal: wet if a TS affects southeast Arizona but dry if not. 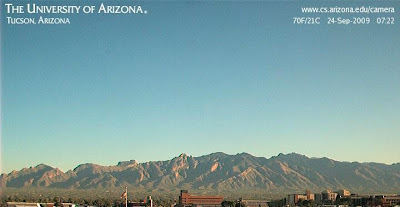 In contrast to the dust down under, it is a crisp Fall morning here in Tucson. Temperature at house dropped to 54F this morniing for lowest minimum since sometime last Spring. This web cam view from the Computer Science building has not had a cloud in it since 5 pm last Monday afternoon! 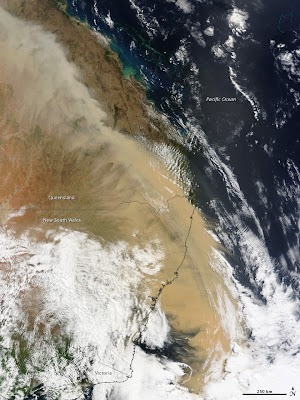 There was a severe dust storm across northeastern Australia yesterday (23 September 2009). The satellite image above shows a huge, thick plume of dust curving around the edge of the continent and spreading south over the ocean. 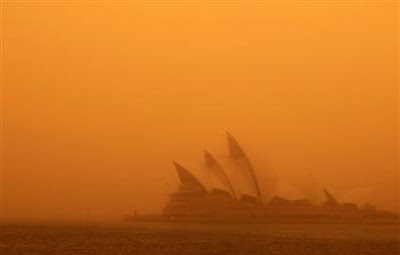 The dust storm was one of the worst in 70 years and even disrupted air travel into Sydney. The marine boundary layer over the Gulf of California is usually shallow with a strong stable layer on top - this boundary layer may just flow around the small area of high terrain. The north end of the GoC and southwest Arizona is a region where low-level divergence prevails during the day and thus is dominated by subsidence (Mike Douglas has a paper about this flow regime). The convective temperatures, when a deeper boundary layer is present, are usually too high for afternoon heating to trigger storms. Thus, storms around the north end of the Gulf tend to move into the region from more substantial higher terrain, propagating on outflows. A deep, subtropical boundary layer, with light winds, sometimes allows local storm development in this area. As is often said - more research is needed for a better understanding of the convective regime around the north end of the GoC. 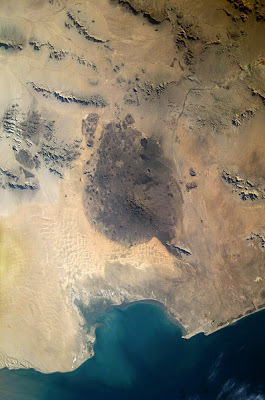 Satellite image above (20 Sept 2009 at 2330 UTC) shows a rare thunderstorm over the el Pinacate Reserve at the north end of the Gulf of California. Even though the Cerro del Pinacate rises to over 3900 ft MSL, thunderstorms and lightning strikes over/near the ancient volcano are very rare, thus the very nice and quite isolated storm, apparently triggered by the Cerro del Pinacate, caught my eye. The obvious questions related to this image are: 1) why are storms rare over this low albedo, high elevation, high low-level moisture, volcanic area? and 2) why did a storm form today? More later. Partial rainbow yesterday evening (Saturday Sept. 19, 2009) over the Catalinas. There were isolated thunderstorms over the mountains yesterday and 1 ALERT station of 93 had measurable rainfall. TS Marty turned westward and was only able to push subtropical moisture about 2/3rds of the way up the Gulf of California. Will continue to monitor the low latitudes in hopes of a rain-making tropical system. 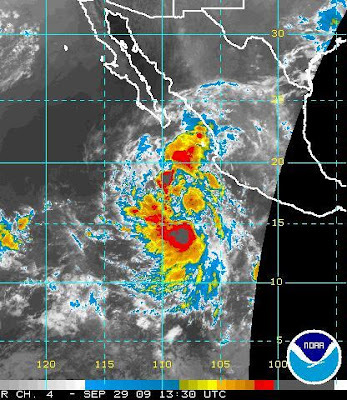 The low that has been spinning away for a couple of days south of Baja has officially become Tropical Storm Marty this morning. The NHC predicts it to move slowly northward and have a rather brief life as a TS. It will apparently move north of 20N in the area where storms can trigger a Gulf Surge of low-level moisture. If Marty triggers a surge, it would most likely affect Arizona late Friday or Saturday. Thus, there is some possiblity that that the baroclinic cut-off that is sinking southward from the Great Basin into Arizona and Marty could interact, at least distantly. Given the weak character of Marty it is too early to guess exactly how things will evolve by the weekend - but at least there are a couple features of interest drifting around our part of the world. As Art Douglas wrote just a bit ago: "Evil drying won." 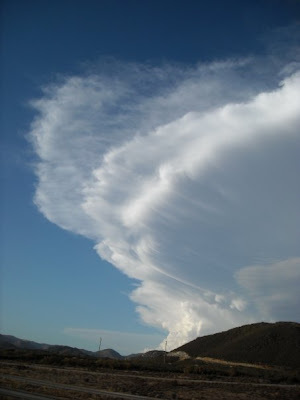 Photo aboves shows convection over the Catalinas this evening (Monday Sep 14, 2009) at its most intense phase! No thunder heard here at the book casita today. On the up side - there is a yet un-officially identified TD or TS spinning away far south of the tip of Baja. Maybe something of interest in a few days? 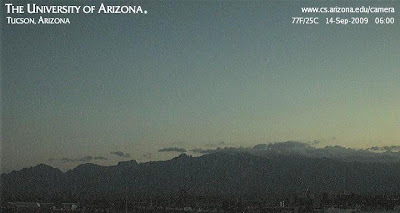 The 6 am image above shows the Catalinas at sunrise this morning (Monday Sept. 14, 2009) and the mystery is: What are those low clouds doing there down on the mountain tops? A look at the morning observations shows that there is southerly, moist flow over southeastern Arizona below 700 mb. This weak push of moisture has lead to an interesting situation. The thermodynamics could evolve today to produce a moderate amount of CAPE over much of the eastern third of the state. This would be happening in an environment that's atypical of the Southwest in summer. The morning sounding (which is a bit too wet) indicates a veering wind profile below 700 mb with moderately strong westerlies above - i.e., a wind profile more like the classic storms environment of the Plains, albeit weaker. The 500 mb trough along the west coast has a strong negative tilt and is digging ashore all the way into northern Sonora. Ahead of this trough the upper-level flow is highly difluent, while the lower-level winds have become southerly. The NAM indicates that the southern end of the trough is going to swing rapidly across southern Arizona as it pulls inland and northeastward. This will bring subsidence and drying behind it. Thus, there seem to be two possiblities today for southeastern Arizona - a rapid drying as the trough swings in before storms get going, or - storms occur in the east and northeast ahead of the trough. Storms that do occur would have some possiblity to be severe given the setting and a supercell or two would not that surprising. Sunday turned out to be quite suppressed with only very isolated, terrain-locked storms - the exception being north in the Rim Country where there were some early and large storms. Only two stations in the Pima County ALERT gauge network mesaured 0.04" yesterday. 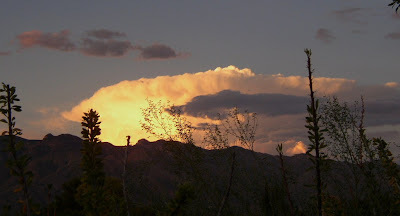 The photo above shows a photogenic Cb north-northeast of the Catalinas at sunset last evening (Sunday 13 Sept. 09 about 6 pm). This storm was occurring on the west slopes of the Galiuro Mountains east of Mammoth, Arizona. This is the same view, taken yesterday, September 12, 2009. Obviously the grasslands around Sonoita have not had a typical summer storm season and are one of the spots in Arizona where folks are praying for a wet Fall. 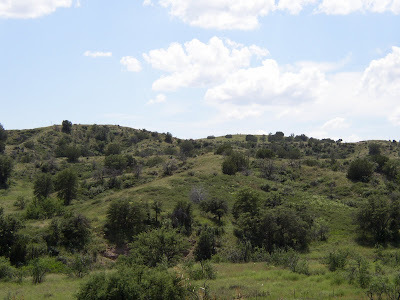 View of hills along a wash 5 miles northwest of Sonoita taken on September 8, 2007. Late August and early September are usually the period when things out there are most green - at times reminding us of Wisconsin. Even though this location is only about 50 miles from Tucson, it is at an elevation of about 5,000 feet MSL and is definitely not in the Sonoran Desert. 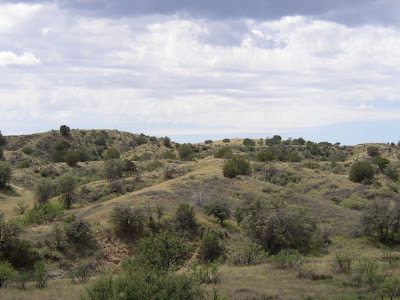 Rather it is in the once famous, southeast Arizona grasslands. 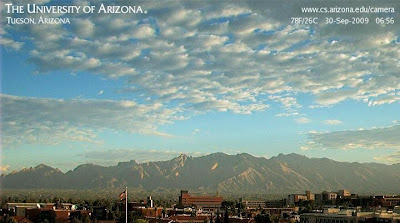 Mt Wrightson, in the Santa Rita Mountains is located only about 5 miles to the west of this particular site. We were away Friday afternoon and yesterday. Friday continued suppressed over eastern Pima County, except for a couple of mountain ALERT stations. However, yesterday's convoluted pattern brought a considerable increase in storm activity, as was well forecasted by the U of A version of the WRF model. We were about 5 miles northwest of Sonoita and thunder rumbled there off and on all afteroon, starting just after 12 noon. The heaviest storms stayed to the east, as per above photo taken looking to the east-southeast about 2 pm. Mountains to the far right are the Huachucas and those to the left are the southern tail of the Whetstones. We returned to Tucson late afternoon and were here to watch the development of storms over the metro area right at dusk (check the Tucson sounding at 00Z but remember that it was not actually as dry as indicated by the flawed data). Thunder and a brief heavy shower left 0.14" in the backyard rain gauge - much needed. Rainfall was measured at 47 of the 93 ALERT gauges in eastern PIMA County giving a coverage of about 50% - the most since a week ago today. Amounts were light with only 18 sites measuring 0.10" of an inch or more. Keystone Peak down to the south of metro area had greatest amount at 0.59." Tucson International airport had a gust from the west of 48 mph to go with its 0.06." Quite an interesting evening with the after-dark storms well indicated by the WRF. The day two WRF indicated increasing low-level moisture as recycling and a slow feed from the GoC continues, with increased storm activity today in the south-central and west parts of southern Arizona. Will be interesting to see what new data and new runs have in store for us. Light showers over the Catalinas early yesterday afternoon. These showers produced rainfall, very slight amounts, at 4 of the 93 ALERT stations in Pima County and that was that. Slow dry out at low elevations continues with PW values down around an inch. Soundings indicate no CAPE at low elevations. At 500 mb a weak cutoff is embedded within the larger western US anticyclone, and is over New Mexico and northeastern Arizona. This is bringing northerly flow and cooler middle-level temperatures across the eastern half of state. With warm surface temperatures this afternoon, we can expect some more high-based Cbs over the mountains and dry, gusty winds at low elevations. Some cirrus streaming in from the Pacific, but not much of great interest on the horizon. September continues much like August. There has been measurable rain here at the house on only 5 days since July 22nd. Yesterday was very suppressed over much of southeast arizona. Only 3 ALERT stations mesured precipitation and these were all up in the Catalina Mountains. Pattern remains very complicated and with weak flow below 500 mb. Precipitable water continues a slow downward trend, as residual low-level moisture is gradually mixed away. CAPE today appears restricted to the mountains and also to New Mexico which has much more moisture and CAPE present and the potential for local heavy storms. Surface pressures continue to rise. At 500 mb a very extended trough lies within the broader anticyclone. This trough extends from southern California, across Arizona and then southwest new Mexico before dipping into south Texas, and then swinging northeastward across Arkansas and on eastward to the coast. Anticyclonic circulation centers are over: central California, central Baja, southern Wyoming, the Gulf of Mexico, and southeast Canada - what a mess! The NAM forecasts that a very large, Rex-like block will develop over the US by Sunday afternoon (see above 500 mb forecast). The model continues to forecast showers over southeast Arizona for the next couple of days, but these will mostly be in the mountains. Here at the house I suspect that we'll not have much hope for rains unless another tropical system were to head north late next week, as the ECMWF seems to hint. Storms developed very quickly yesterday late morning yesterday and by early afternoon we anviled out here at the house. At dark there were several cells just to the west that produced a good lightning show but only a spit of rain at house. Measurable rainfall occurred over about 50% of eastern Pima County during last 24 hours. Nine stations within the ALERT network had half an inch or more and 3 stations measured over an inch. The weak flow continues today with a large ridge over the Southwest and northern Mexico with embedded features drifting around. Thermodynamics a bit more stable today with more heating required for storms to develop at lower elevations. Surface pressures this morning are up about 3 mb relative to yesterday, when they'd fallen 3 to 4 mbs. Precipitable water remains around 1.25" over south central Arizona. All-in-all not much to say about this stagnant pattern except that NAM forecast indicates interesting changes by Friday, as a large complex cyclone becomes embedded in the ridge, while pushing main anticyclone north and west. Where Have the Winds Gone? Remnants of the little orphan Cb less than an hour after photo below - very sad show. Lapse rates are now very steep up to 600 mb; little surface heating is required to establish a very deep boundary layer; yesterday's hostile layer (see below) seems to have drifted away somewhere; precipitable water remains highest over south-central Arizona (note that we're in a cycle where the RRS sounding data are too moist in the morning and too dry in the evenings); there appears to be some CAPE present over low elevations, although best instability remains over the mountains; since there is little in the way of a defined steering flow, storms today will drift wherever the CAPE leads them. 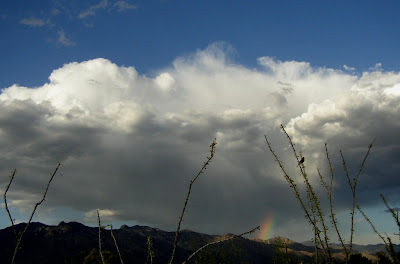 About as exciting as the weather got yesterday (Labor Day 2009) - little orphan Cb north side of Catalina Mountains. Was quite suppressed yesterday with storms able to form weakly only on the higher elevations. Apparently dry and warmer middle-level air advected in from the northeast between 700 and about 550 mb, limiting CAPE and increasing CIN and in general making the afternoon environment more hostile to convection. Although the day-today changes were subtle, coverage of precipitation varied quite a bit day-to-day over the Holiday weekend. Rainfall coverage over Arizona 33 (Metro Tucson aka Eastern Pima County) was about: 20% on Friday; 30% on Saturday; 60% on Sunday; and only 13% on Monday. 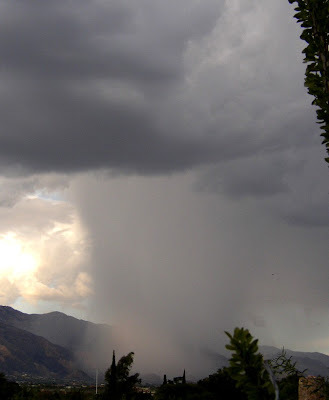 Wet microburst over the Catalina Foothills yesterday evening produced by the small storm whose radar image is shown below - looking slightly east of north from house at about 6 pm MST. There have only been slight changes in the overall situation since yesterday's discussion. The weak 500 mb trough that is embedded within the larger 500 mb anticyclone has shifted slowly and now lies from northeast New Mexico southwestward across extreme northern Sonora, with quite a bit of residual cloudiness along it. The shift of the trough has led to northeasterly winds in the layer from 500 mb to 300 mb -giving some hope of a defined steering flow, but the NAM forecast indicates weaking wind speeds by evening. There seems to be a very slow down trend in precipitable water; dewpoints remain high across southern Arizona; and the lower half of troposphere continues to have low to moderate amounts of CAPE, but with a weak and chaotic wind regime holding forth. Thus, a somewhat similar day to yesterday should repeat with storms forming easily on mountains and then trying to propagate toward the south or southwest. At 6 pm MST yesterday afternoon there was still little activity in the region affected by dry subsidence earlier in afternoon (see below). There was one small echo on the south side of the Catalina Mountains (inside elipse) and directly south of that echo, just across the border, was a much larger storm (arrow) that had been reported as severe at Rio Rico and probably at Nogales. Surface obs have not been available for Nogales since 4:25 pm yesterday, when a heavy thunderstorm was in progress. Nogales had received 0.51" of rain in 35 minutes and heavy rain continued when the site went down. Later in the evening a number of storms developed oover the Tucson metro area, possibly above or around the edges of the dry dome (remember that given the same P and T dry air is more dense than moist air). With the very light flow aloft, the storms may have formed because of the earlier, mesoscale drying - a bit of a conundrum. We had rain here at the house but only 0.10". Tucson airport had 0.64" and 49 of the 93 Alert gauges measured rainfall - about 55 to 60% areal coverage and up substantially from previous day. I posted some photos on Facebook from yesterday's storms and also from Wednesday's storms. I think anyone should be able to look at them. Unfortunately the best photos eluded me. As the air mass was drying from the west and early convection seemed to be capped, I thought that yesterday was going to be a down day in Southern California, boy was I wrong. Yesterday afternoon brought the most impressive line of cumulonimbus that I have ever seen. Outflows from Colorado River Valley storms generated severe storms when they hit the eastern side of the Peninsular Range late in the afternoon. After not paying too much attention to what was going on I looked out about 5pm to see one massive storm lined up immediately adjacent to another, stretching as far as the eye could see across the eastern horizon, from Riverside County down toward the Gulf of California. I hopped in my car and drove east along I-8. When I got closer to the CBs they were spectacular: massive, with brilliantly lit hail streaks coming down their west side. The NWS said that they were topping out at 60,000 feet and radar was indicating 3" hail. I took some photos from the freeway exit at Mt. Laguna, then raced farther along I-8, and made a tactical error that prevented me from getting a spectacular photo. The freeway heads south for a while past Mt. Laguna, so it wasn't gaining on the storms. Then once it comes out of a valley and turns east again, there is an exit which comes up pretty suddenly, and I just planned on staying the freeway a bit farther. That's when I looked to the north and saw something spectacular: not just the massive brilliantly lit west side of the anvils, but also a haboob which was being turbulently driven up the east side of Mt. Laguna. This dust cloud, which was no doubt generated on the desert floor, had been pushed up the 4000' eastern escarpment of the Peninsular Range and was now moving west across the ridges and valleys of the mountains, and when I saw it was climbing the east side of 6000' Mt. Laguna. This would have been an amazing photo, but unfortunately I was still going 75mph east on the freeway, with no exits for 10 miles. After a couple miles we drove into the dust cloud, visibility dropped below one half mile, and the fun was over. It was a cool day yesterday because of the abundant cloud cover and several days of convection. Highs were mostly in the 80s with some places getting into the 90s. Strongest storms occurred out in the lower Colorado River Basin - Yuma was slammed by the second heavy storm this summer and also recorded 1.62" of rain. Two big storms in Yuma likely translates to a very wet summer for them! Here in the Tucson metro area there were several strong cells that drifted westward just before dark. Photo above shows one of these to the northeast of the house while it was producing lots of lightning and loud rumbles of thunder. This is as close as it got however and there were again only outflows and no rain here at house. The morning showers and heavy clouds yesterday morning kept things fairly suppressed. There was rain measured at 25 of the ALERT network stations, which translates to about 30% areal coverage. The heaviest measured total was at Rincon Creek with a down pour of 1.81 that triggered flash flood warnings from the NWS. Things are changing, but slowly this morning. The 500 mb pattern remains ill-defined over most of the US and Mexico, the exception being the strong trough in the Pacific Northwest. The anticyclone is indistinct with weak centers over the Gulf of California and also over the southern Gulf of Mexico. A weak short-wave is over western Arizona and this will be moving slowly into the southeastern corner of the state during the day today. The upper-level short-wave has run east of the feature at 500 mb and extends from western Wyoming south to southern Baja. This will bring increased difluence aloft to much of Arizona this afternoon. Low-level moisture is little changed; there is moderate CAPE available; and there is CAPE present for parcels in the Tucson morning sounding from the surface up to about 600 mb. 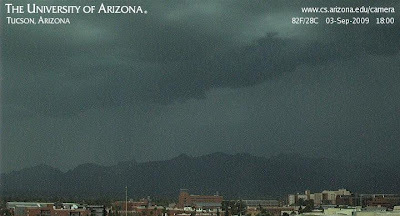 Thus, more storms today, some with heavy rains - as per the area of storms currently south of Tucson. Storms from the mountains will try to move east, but winds are so light below 400 mb that local outflows will be able to drive storms in any direction, particulalry toward local maxima of CAPE. 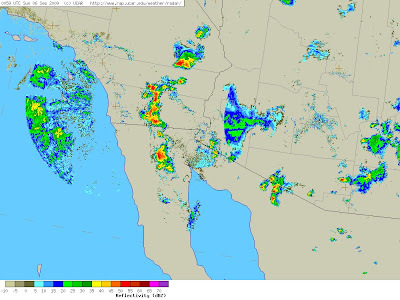 No question today about whether storms will occur in the lower deserts - nice area of echoes currently northwest of Tucson - see vis image above. These are drifting a bit toward the south and southwest, reflecting the very chopped up pattern and its light winds in lower and mid-levels. Moisture remains high in the lower half of troposphere and morning convection and heavy cloud is affecting much of Arizona, Utah and southern California. A weak middle-level trough will be moving slowly across Arizona today and tomorrow, and there appears to be nicely difluent flow at high levels with this feature. There also appears to be an inverted trough at 700 mb brushing westward along the Arizona borderlands. So, an active weekend on tap. Storms, given the small to moderate amounts of CAPE and light steering winds, will have potential to produce local heavy rains and perhaps wet microbursts. There were fewer storms around yesterday (Friday Sept. 4th 2009) afternoon than on Thursday. Here at house we had thunder and outflows but no rain. 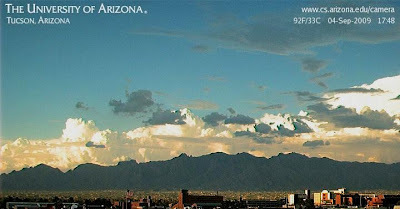 Evening web cam shot above shows towers north of the Catalinas with a Cb off to the east. Only 19 of the 93 Pima County ALERT gauges had rainfall. 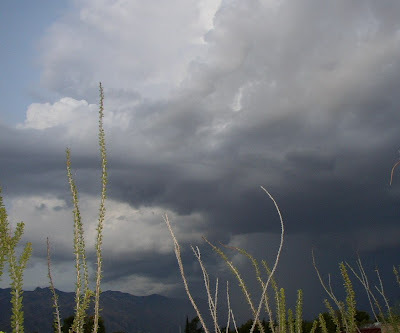 Storms tended to be terrain-locked yesterday, although some very strong storms occurred at lower elevations out to the west of Phoenix during the evening, with some weaker cells out over central pima County. There were severe winds with storms out around Kingman (measured gust to 64 mph) and west to the Colorado River - six injuries at a trailer park in Mohave Valley. There was also a report of golf ball-sized hail out there. This morning there was a slow-moving arc of thunderstorms to the northwest of Tucson providing a bit of a lightning show at sunrise as the full moon set. More of the Same Today? The 500 mb NAM initial analysis this morning (above) indicates that a poorly organized ridge, with numerous embedded weak features of both cyclonic and anticyclonic natures, continues to prevail across most of the Southwest and Mexico. Winds are very light through the lower troposphere below 400 mb. Above 400 mb Pacific westerlies (i.e., a Fall flow pattern) are present to quite low-latitudes, with dry air aloft over most of Arizona. It's not a pretty picture. The Tucson and Phoenix soundings continue to have a nice amount of residual moisture present with PWs of around 1.50" in the southwest part of state and around 1.25" in the south central (note that the Tucson RRS sounding appears to be about 0.20" too wet this morning). Low levels have cooled around 5-6F after yesterday's storms and, although the soundings have CAPE, it's not clear whether there will be enough heating to re-establish a single, deep boundary layer. It appears most likely that there'll be an afternoon air mass over low elevations that'll need a nice kick from mountain outflows. There is substantial CAPE at high elevations and the mountains will be able to bubble away very nicely, given the low shear up to 400 mb. It appears that what steering flow there'll be will be northerly. My guess is that there's a 50 to 60% chance of a storm here at the house, since conditions appear favorable for Catalina Mountain thunderstorms to come down our way. The models forecast the next two days will be stormy and wet, as a weak trough moves across the state from west to east. I'll watch day-by-day and also hope that everyone has a great Labor Day weekend. Finally there was a somewhat decent rain event across southeast Arizona. All reporting stations and also RAWS sites in Pima, Santa Cruz, and Cochise Counties reported measurable rain with the exception of Douglas. Rainfall was also measured at 72 of the 93 Pima County ALERT gauges. So there was a quite high coverage of rainfall. Much greater coverage than I would have predicted (given the very weak wind fields present yesterday below 400 mb) and much greater than forecast officially. Nine stations in the Alert network reported a half inch or more - these were foothills and mountain stations, with the maximum amount being 0.91" at Empire Peak. The storms moved into town from the north, see above Computer Science web cam photo looking north at 6 pm. We had thunder, mostly in-cloud lightning and 0.24" of rain here at the house. Looks like, in addition to good mountain CAPE and some low-elevation CAPE, an upper-level jet nosed in from the Pacific to help provide a bit of large-scale vertical motion. There was perhaps a weak inverted trough across southeast Arizona but this feature was fairly stagnant - the sounding from Tucson was missing last evening so there's little hard observational data to examine. "Combined monsoon and Jimena fringe moisture contributed to very high precipitable water values over Southern California yesterday. PW at San Diego reached 49.6 mm in the 00Z sounding and the deep moisture and strong heating caused several rounds of strong thunderstorms over our mountains and inland valleys, beginning shortly after 10am. Several places had 1+ inch of rain with local flooding. Dime-sized hail and a funnel cloud were also reported. At my house I had to settle for thunder and lightning in the morning and again in the afternoon, but no rain. Looking for some sort of repeat performance today." Jimena has stalled and the remnant core may actually be moving a bit to the southeast over western Mexico. the NHC predicts the remnant low-level circulation to drift west back across Baja. Regardless, we will have to be satisfied with the nice increases in low-level moisture that have occurred over Arizona. The overall large-scale pattern across all of soutwest North America is very chopped up, with numerous small features embedded here and there within the large 500 mb anticyclone. The Tucson sounding indicates a layer of easterly steering flow with upper-level winds reamaing westerly. There is some CAPE, which could be enhanced by local heating. Thus, it appears to me that things will be very driven by small scale details today. The NAM indicates a nice area of storms across southeast Arizona both today and tomorrow. I'm so beaten up that I've reached a state of "I'll believe it when I see it." Yesterday was a fairly down day across all of southern Arizona with post-MCS suppression west of here and periods of easterly downslope from Tucson east. There were some light showers and thunder across parts of the metro area but rain amounted mostly to sprinkles. Only 5 sites in the Alert network had rain; here at house there was both thunder and some sprinkles. 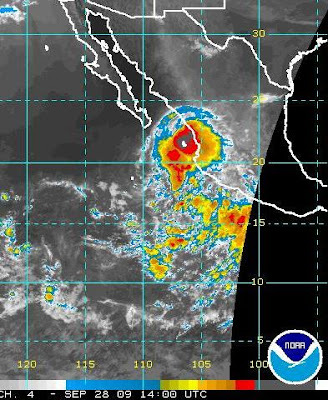 Jimena came ashore onto the Baja penninsula some time last night and appears to be over or west of the Baja spine this morning, as possibly a Cat 2 hurricane. Jimena will weaken rapidly today and probably move slowly north. The big change overnight is that the anticipated track of Jimena was drastically modified by NHC. 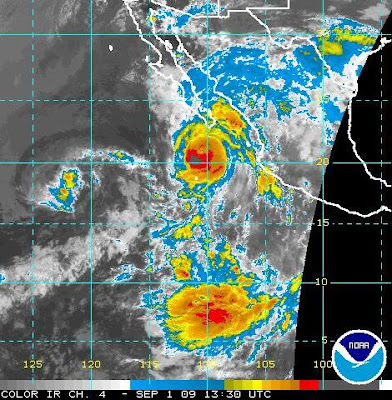 The storm is now expected to drift west from Baja as an orphan low while the 500 cyclone moves north into the ridge before shearing apart over northern Mexico. Interestingly, the ECMWF operational model had indicated this for several runs now and has apparently won out over all the more sophisticated hurricane guidance models. What will be Jimena's impacts here? Moisture continues to increase slowly across all of southern Arizona - PWs are now from 1.30 to 1.75" and high dewpoint air is coming across the border out across southwest Arizona. Middle-level temperatures are increasing along with the moisture increases, but there does appear to be some increase in CAPE today. The wind shear profile above 700 mb is reasonably favorable for strong storms, with lower level winds being light and variable. Cloud cover is increasing from the south and there appears to be an old shower band from Jimena east-west along about 30N. This feature is moving to the north also. Thus, the amount of sunshine and boundary layer heating may be limited by afternoon. Increases in low-level moisture would however increase CAPE rapidly - complicated situation, but I think that it's about a coin-toss for storms real rain today here at house. Tomorrow and Friday are even more complicated, as the air mass transitions to a tropical one and the 500 mb Jimena circulation deforms across northern Mexico, essentially captured inside the expanding anticyclone. This is a very potent situation for heavy rains and the exact track of the Jimena remnants is hard to determine at this time. Careful monitoring definitely required through Friday morning. By the weekend, things are predicted to have returned to a typical summer pattern with ligering low-level moisture, before the next Pacific trough moves into the west coast. Sunday's Star story is now on track - see above IR image - and to be fair I should mention that the Sunday story was from AP and not locally written. The activity out to the west of Jimena is from the remnants of TS Kevin and there is a huge cloud cluster at low-latitudes south of Jimena - so the tropics/subtropics are very active! Underchaotic skies, it was a red sunrise this morning - back at the Military Weather Warning Center we used to say "Red sky in the morning; tornado without warning!" However that little maxim doesn't fit out here at all. We did not get the strong low-level push of moisture that I'd expected from the GoC - the leading 500 mb impluse is just now passing and the pressure gradient at the surface has now reversed. There is a 2 to 3 mb down-the-Gulf gradient after 2 to 4 mb rises in Arizona in the wake of the MCS. So moisture is on a gradual rise from the synoptic flow above 850 mb couple with a lot of recycling from yesterday's storms. There is abundant cloud cover over western Arizona (where the largest increases in precipitable water have occurred) and over southern Arizona and northern Mexico so that there will be some reductions in daytime heating. Increased low-level moisture may lead to a double boudary layer structure today, making the forecast difficult. Yesterday's WRF runs for day 2 indicated downslope easterly winds today acting to suppress storm activity in the southeast. This will be the key forecast issue today. The NAM this morning indicates that the storms and rains will tend to avoid the southeast today also. This is problemattic since the morning upper-air charts don't indicate strong easterlies. I will await the WRF runs with great interest. Careful watch needed again as the afternoon evolves. In the longer term the overall event this week depends upon the track of Jimena and how much moisture she carries with her as she decays. 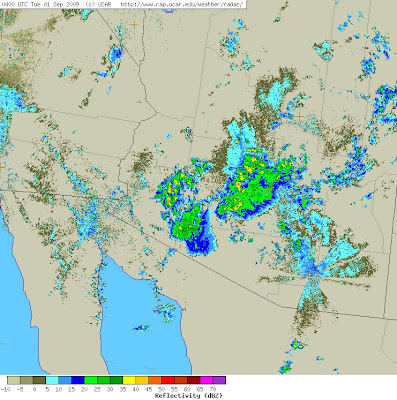 Yesterday the expected uptick in storm activity did occur (see 0400Z regional radar above), except that it started just west and northwest of the Tucson metro area. The storms persisted through the night and there was a morning MCS over the lower Colorado River Basin. Rains were light as per most August events with a lot of wind and dust. With gusts over 40 mph noted at Phoenix, Luke AFB, and Kingman and even quarter-sized hail at Skull Valley. Here in the metro area only 9 stations in the Pima County ALERT network had measurable rain. My subjective appraisal of yesterday's model forecasts is that the WRF, both versions, was far superior to the NAM. However, both versions brought lines of storms through the Tucson metro area.